It is a frightening thought to imagine the ground below your feet or house suddenly collapsing and forming a big hole in the ground. Sinkholes rarely happen, but when they strike, tragedy can occur. Sinkholes happen when the ground below the land surface cannot support the land surface. They happen for many reasons; read on to educate yourself about sinkholes. Sinkholes are common where the rock below the land surface is limestone, carbonate rock, salt beds, or rocks that can naturally be dissolved by groundwater circulating through them. As the rock dissolves, spaces and caverns develop underground. Sinkholes are dramatic because the land usually stays intact for a while until the underground spaces just get too big. If there is not enough support for the land above the spaces, then a sudden collapse of the land surface can occur. These collapses can be small, or, as this picture shows, or they can be huge and can occur where a house or road is on top. The most damage from sinkholes tends to occur in Florida, Texas, Alabama, Missouri, Kentucky, Tennessee, and Pennsylvania. A sinkhole is an area of ground that has no natural external surface drainage--when it rains, the water stays inside the sinkhole and typically drains into the subsurface. Sinkholes can vary from a few feet to hundreds of acres and from less than 1 to more than 100 feet deep. Some are shaped like shallow bowls or saucers whereas others have vertical walls; some hold water and form natural ponds. Typically, sinkholes form so slowly that little change is noticeable, but they can form suddenly when a collapse occurs. Such a collapse can have a dramatic effect if it occurs in an urban setting. The map below shows areas of the United States where certain rock types that are susceptible to dissolution in water occur. In these areas the formation of underground cavities can form, and catastrophic sinkholes can happen. These rock types are evaporites (salt, gypsum, and anhydrite) and carbonates (limestone and dolomite). Evaporite rocks underlie about 35 to 40 percent of the United States, though in many areas they are buried at great depths. Since Florida is prone to sinkholes, it is a good place to use to discuss some different types of sinkholes and the geologic and hydrologic processes that form them. The processes of dissolution, where surface rock that are soluble to weak acids, are dissolved, and suffusion, where cavities form below the land surface, are responsible for virtually all sinkholes in Florida. Dissolution of the limestone or dolomite is most intensive where the water first contacts the rock surface. Aggressive dissolution also occurs where flow is focused in preexisting openings in the rock, such as along joints, fractures, and bedding planes, and in the zone of water-table fluctuation where groundwater is in contact with the atmosphere. Rainfall and surface water percolate through joints in the limestone. Dissolved carbonate rock is carried away from the surface and a small depression gradually forms. On exposed carbonate surfaces, a depression may focus surface drainage, accelerating the dissolution process. Debris carried into the developing sinkhole may plug the outflow, ponding water and creating wetlands. Gently rolling hills and shallow depressions caused by solution sinkholes are common topographic features throughout much of Florida. Cover-subsidence sinkholes tend to develop gradually where the covering sediments are permeable and contain sand. In areas where cover material is thicker, or sediments contain more clay, cover-subsidence sinkholes are relatively uncommon, are smaller, and may go undetected for long periods. Granular sediments spall into secondary openings in the underlying carbonate rocks. A column of overlying sediments settles into the vacated spaces (a process termed “piping”). The slow downward erosion eventually forms small surface depressions 1 inch to several feet in depth and diameter. In areas where cover material is thicker, or sediments contain more clay, cover-subsidence sinkholes are relatively uncommon, are smaller, and may go undetected for long periods. Cover-collapse sinkholes may develop abruptly (over a period of hours) and cause catastrophic damages. They occur where the covering sediments contain a significant amount of clay. Over time, surface drainage, erosion, and deposition of sinkhole into a shallower bowl-shaped depression. Over time, surface drainage, erosion, and deposition of sediment transform the steep-walled sinkhole into a shallower bowl-shaped depression. As spalling continues, the cohesive covering sediments form a structural arch. The cavity migrates upward by progressive roof collapse. The cavity eventually breaches the ground surface, creating sudden and dramatic sinkholes. Below are other science topics associated with sinkholes and land subsidence. Below are publications associated with sinkholes and land subsidence. 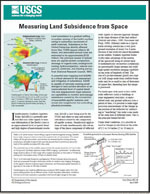 Measuring land subsidence from space; 2000; FS; 051-00; Galloway, Devin L.; Jones, David R.; Ingebritsen, S. E.
Below are news stories associated with sinkholes and land subsidence. This year, groundwater levels in many wells in California’s Central Valley are at or below historical low levels. In addition, from 2007 through 2015, land subsidence that correlates to areas with large groundwater level declines has strongly increased in two large agricultural areas near the towns of El Nido and Pixley, according to a new article by the U.S. Geological Survey. Extensive groundwater pumping from San Joaquin Valley aquifers is increasing the rate of land subsidence, or sinking, that could result in serious operational and structural challenges and repairs to water infrastructure, according to a new report by the U.S. Geological Survey. 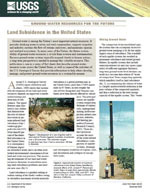 Below are FAQ associated with sinkholes and land subsidence.